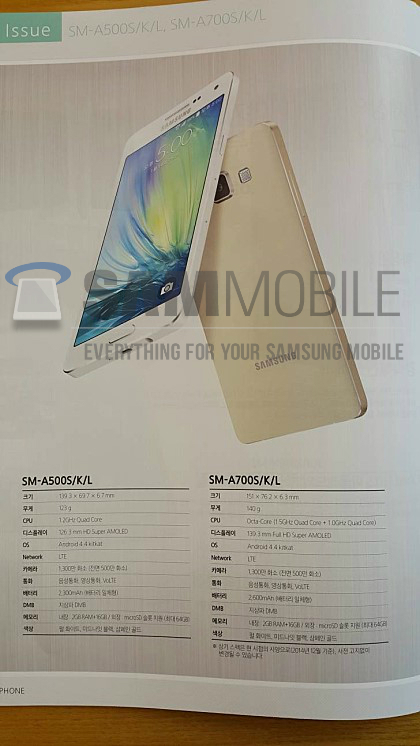 A Samsung brochure was recently leaked in South Korea, the company's home nation. 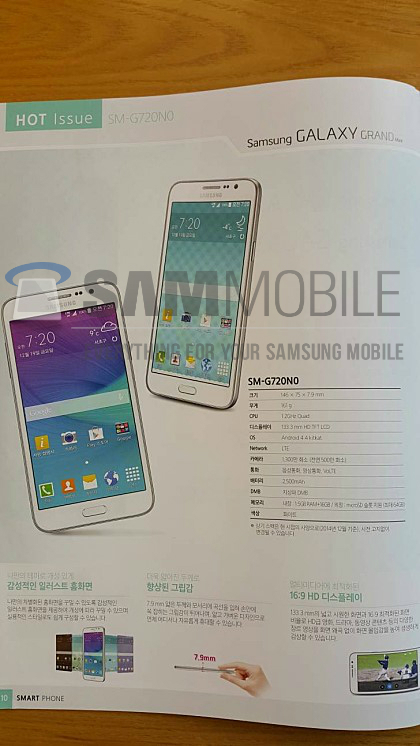 Although most of the smartphones which are detailed in the brochure are well known to us, the brochure also reveals two currently unannounced smartphones, the Galaxy A7 and the Galaxy Grand Max. According to the brochure, the Galaxy A7 will come with a metallic body which measures just 6.3mm across the waist and tips the scales at 140 grams. The brochure also lists most of the smartphone's specifications, such as a 5.13-inch Super AMOLED display with a resolution of 1920 by 1080 pixels, an unnamed octa-core processor running at 1.5GHz, 2GB of RAM, 16GB of integrated storage space, LTE compatibility, a microSD card slot for expanding the internal storage, and a 2500mAh battery. In the camera department, the Samsung Galaxy A7 will come with a 13MP primary camera and a 5MP front-facing secondary sensor. The brochure also mentions that the smartphone will launch with Android 4.4.4 KitKat on board. Although the Samsung brochure doesn't mention the chipset model for the Galaxy A7, a retailer from Russia gives us a helping hand in deciphering the mystery. According to merlion.com, the Samsung Galaxy A7 will be powered by the Exynos 5433, the same chipset that powers one of the two Galaxy Note 4 versions currently available for purchase. The same brochure also allows us a sneak peak at the Galaxy Grand Max. While Grand Max and the A7 will be similar in screen size, they are totally different beasts. The Galaxy Grand Max will feature a 5.24-inch display with a resolution of 1280 by 720 pixels, a quad-core processor clocked at 1.2GHz, 1.5GB of RAM, and 16GB of expandable internal storage. Unlike the metal-clad Galaxy A7, the Galaxy Grand Max will be built out of plastic. 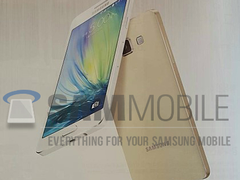 At the moment, it is unknown when Samsung plans to officially unveil the two new smartphones.